Kindle And Me...: The Golden Lily (Bloodlines #2) by Richelle Mead. Publication : June 12th 2012 by Razorbill. I have to wait a WHOLE year for the next one? Richelle Mead, you're killing me! The Golden Lily is hands-down my most anticipated book this year. I'll admit Bloodlines was disappointing but I could see where the story was going and I had faith in Mead to develop a swoon-worthy romance that makes my heart pound..and she did it. While I don't think this series can ever compare to The Vampire Academy series, Bloodlines has it's own special place in my heart because, let's face it, we ALL love Adrian. I absolutely loved every moment that Adrian and Sydney spent together in this book, I adored watching them grow closer, like it was the most natural thing in the world. However, The Golden Lily proved that this series is very different from VA; where VA was more action-packed and intense, Bloodlines is more realistic; the romance about two very different people falling in love unexpectedly and the story is a more young adult, it doesn't have any of the darkness or intensity that VA did. Sure, there was a storyline going on regarding Sonya Karp, Vampire Hunters and all that but honestly, that didn't engage me much and I think that's the only problem I had with this book. The characters are as lovable as ever - Eddie, Jill and even Angie has grown on me and it goes without saying that I love Adrian and Sydney but the story lacks the captivating quality that Vampire Academy had. To me, Adrian and Sydney made this book. The ending made my knees go weak and had me pulling my hair out because the book was over, but I guess it's a feeling I have with all of Richelle Mead's books when they end. 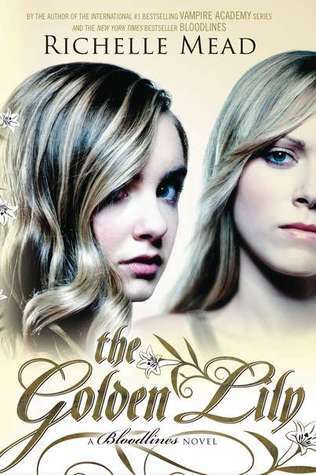 To make it short, those who were let down by Bloodlines, for the most part The Golden Lily will not disappoint you. If it's romance that you're looking for, it's all there! I really want to read this book. I put off this series for the longest time because I was afraid of being disappointed after loving VA so much. While Bloodlines wasn't nearly as good, I still enjoyed it and definitely want more Sydney and Adrian! I LOVE Adrian more than Dimitri too!! I so can't wait to read this. I don't think I'd love this less even if the plot's predictable. Bloodlines was predictable too but I still end up loving it. Have you read the teaser for book 3?